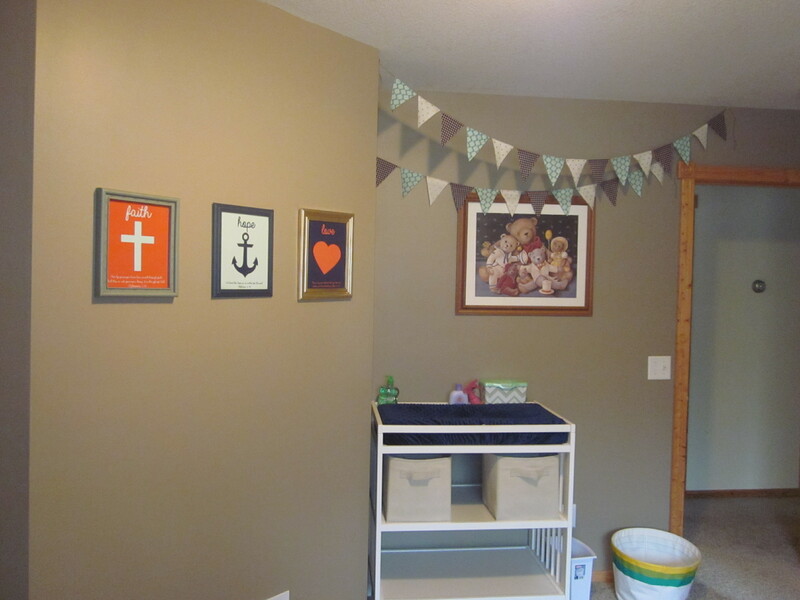 At long last, here are the pictures of Bisky Junior’s nursery! 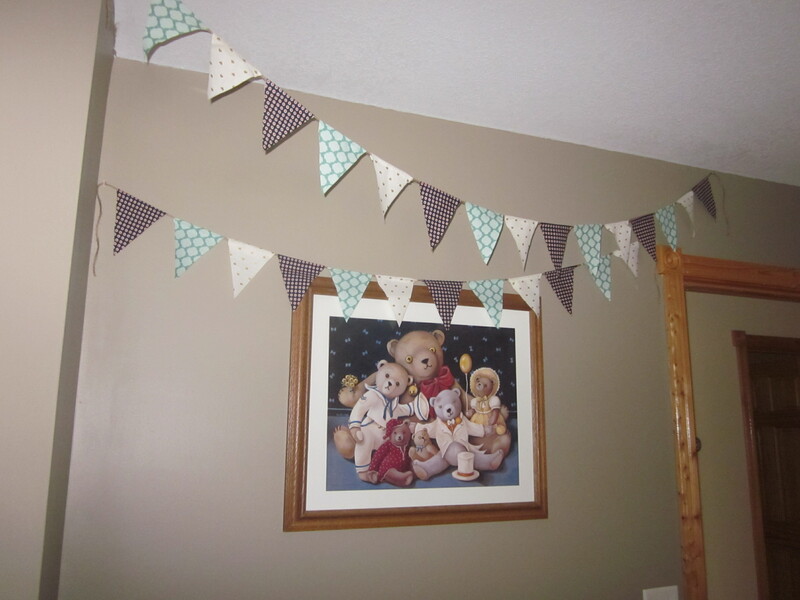 Since we don’t know if we’re having a boy or a girl, the nursery had to be mostly gender neutral. 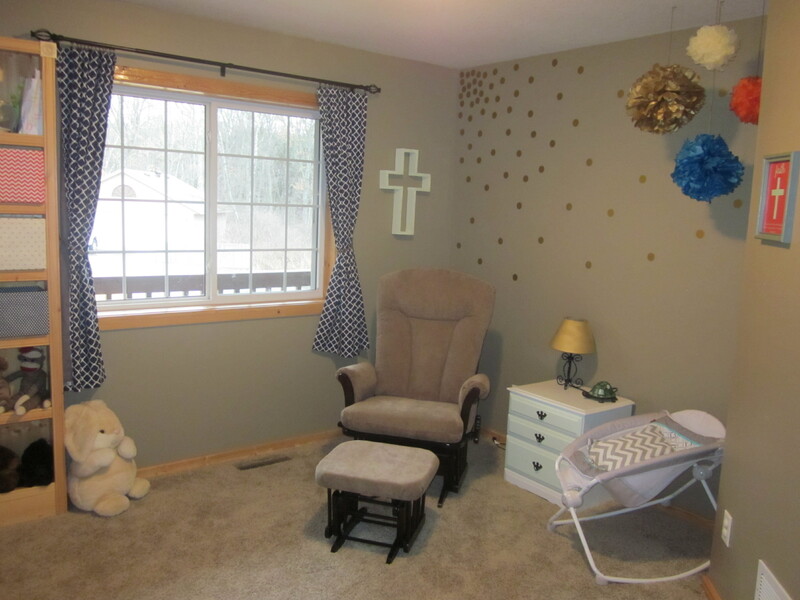 But I felt ok with making it slightly girly because I’ll be the one spending the most time in that room (besides baby of course, but he/she won’t care how it’s decorated for a while). 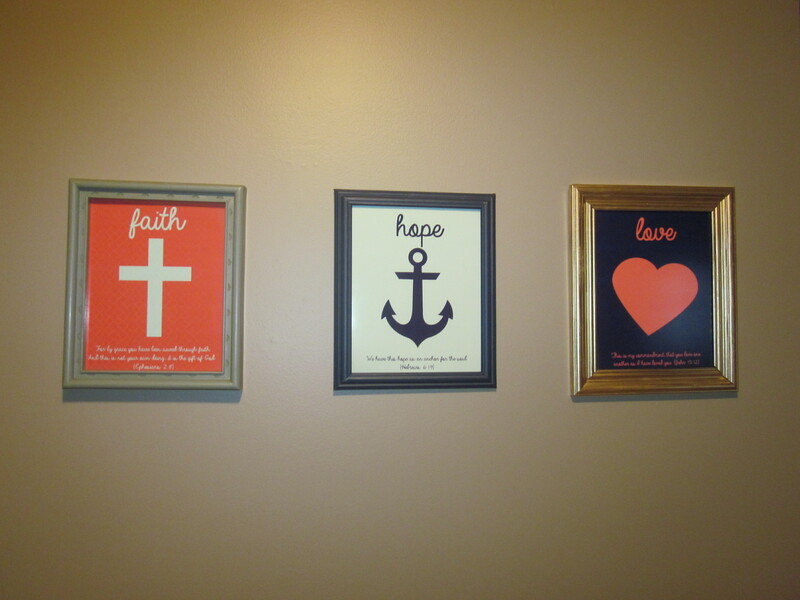 We had an extra gallon of paint left over from painting our living room (Rolling Pebble from Behr), so that’s what we used on the walls. 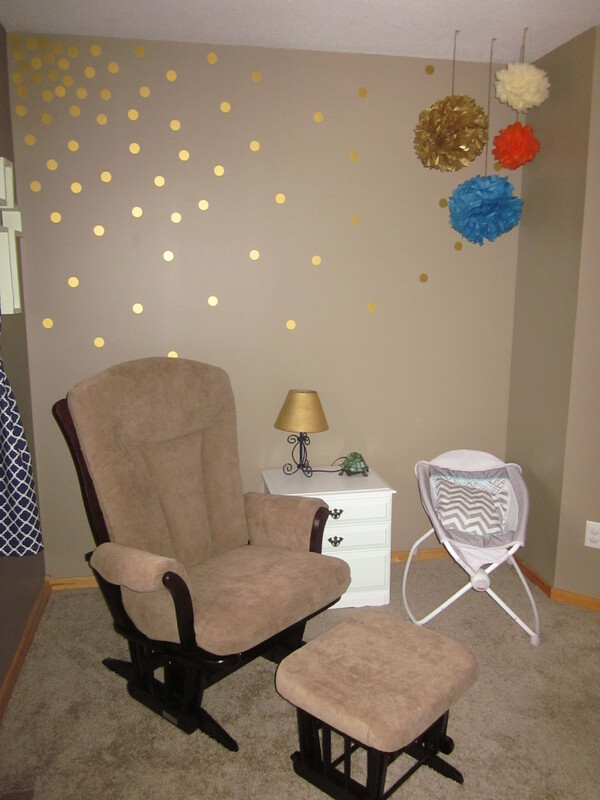 I was inspired by pictures on Pinterest (here’s the link to my Nursery Inspiration board) to buy gold dots from WallsNeedLove.com. So fun! 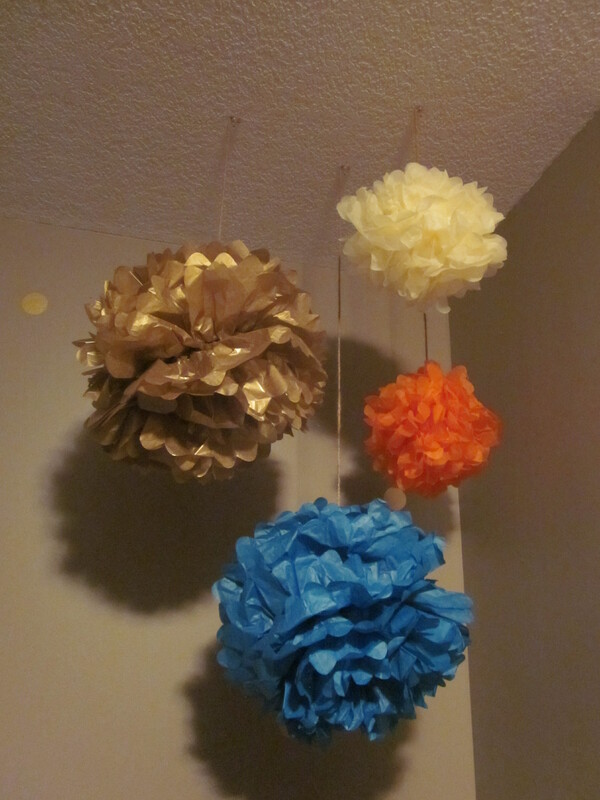 I bought the poms from Luna Bazaar — they are super easy to make yourself but I couldn’t find the tissue paper colors I wanted in brick ‘n’ mortar stores. There’s way more selection online. The blue pom isn’t quite the right color, so I ordered a navy blue one off Etsy. It should be coming any day now. The glider was a gift from my parents. We tested out chairs in a store, but ended up buying online because it was way cheaper. It’s the Dutailier Grand Gilder from Babies R Us. Love it so far! 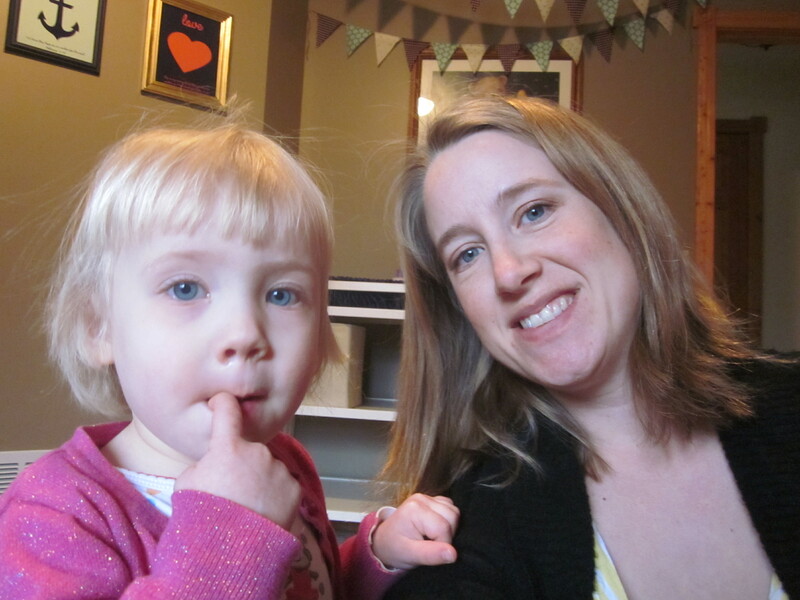 We decided on a more traditional glider this time because we found our Best recliner glider to be slightly too deep and short for our comfort — though don’t get me wrong, it’s still a great chair and we use it all the time with Emma. 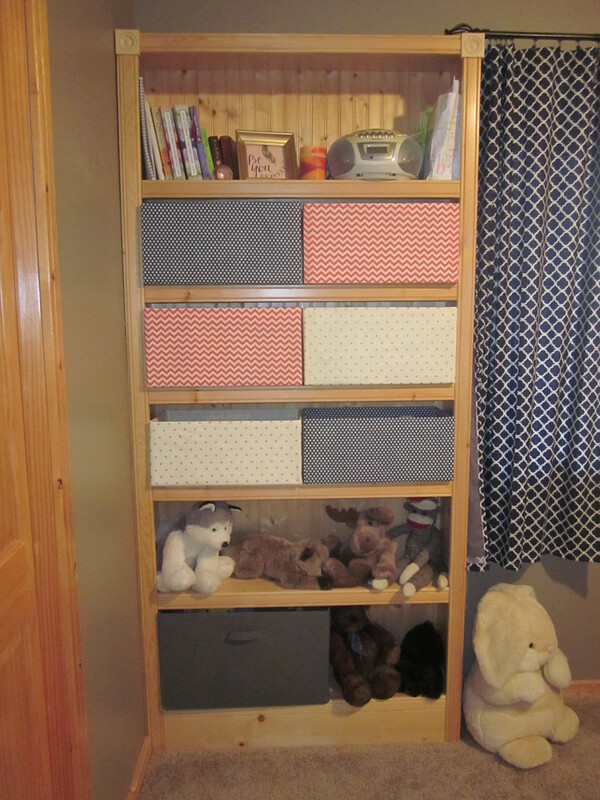 We moved Emma’s changing table out of her room (using the top of her dresser as her changing table instead). You may be wondering where the crib is… well, we don’t want to buy a second one and plan to use the Rock n Play for the first 4-5 months anyway. 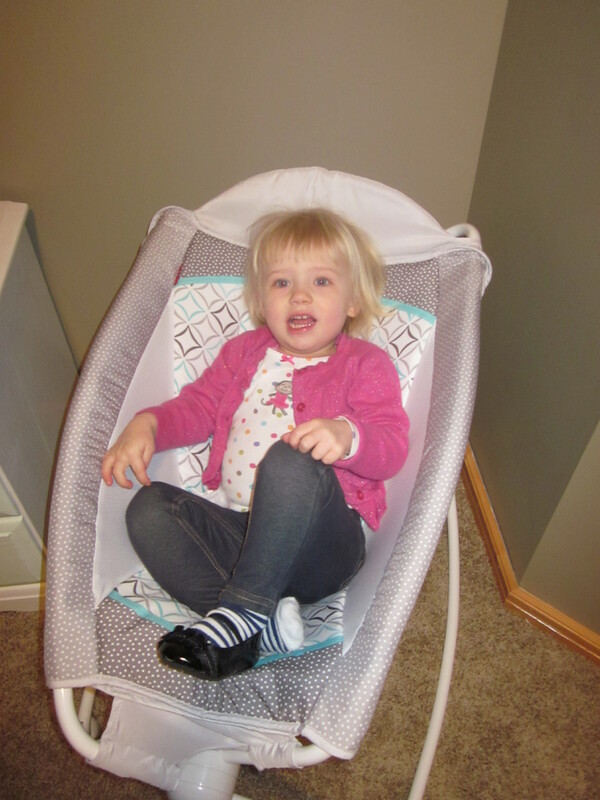 So we’re hoping to transition Emma into a toddler bed by the time the baby needs the crib. We might also use our Pack n Play to fill in if the timing isn’t perfect. This bookshelf is a built-in, and the people who built it really designed it for books only. The shelves are fairly shallow and not adjustable height-wise at all. We were at a loss on how to utilize this space (since taking the bookshelf out wasn’t an option) and discovered that old diaper boxes were the perfect size! 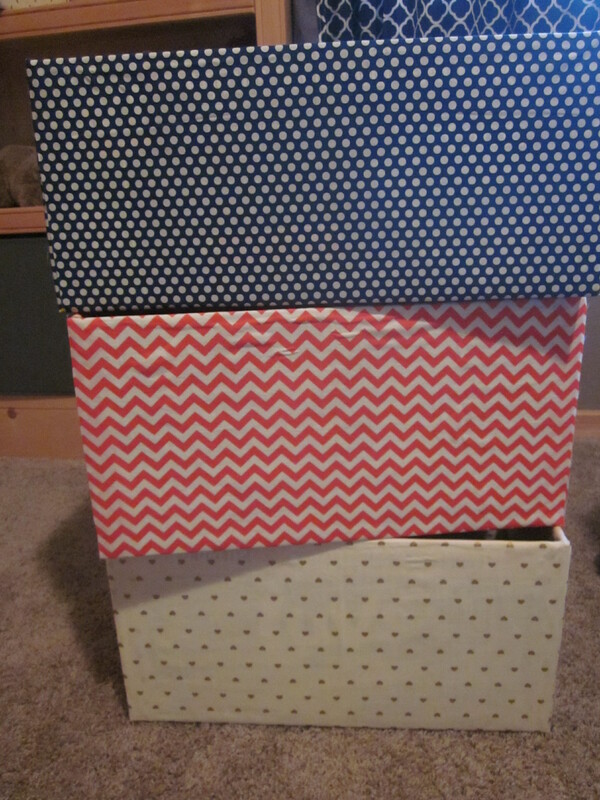 I covered them with fabric (another Pinterest idea) and plan to use them in lieu of a dresser. I have labels to put on the front, but am waiting until we know Junior’s gender, since that will probably affect how I label them. The fabric cost me about $45 (I used a yard for each) so they weren’t the cheapest things in the world, but they turned out well! 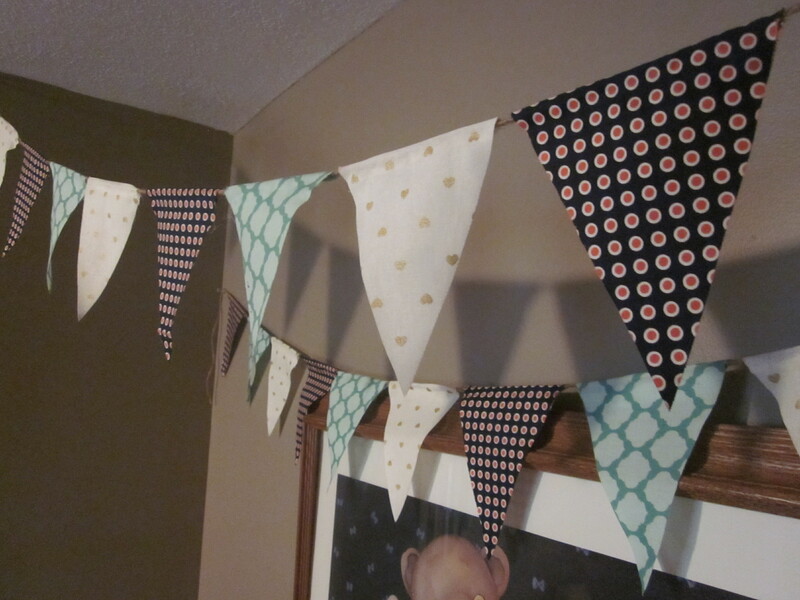 Yet another inspiration from Pinterest, I made no-sew bunting with some fun fabric. I was on the fence about whether or not this was worth the effort, but now that it’s hanging up, I’m glad I did it. If you have any questions about how I made it, let me know. But as I’ve remarked before, other bloggers do tutorials much better so I won’t go into the details here. This room, like almost every room in the house, had no window treatments, so I sewed curtains (which actually turned out room-darkening enough to not necessitate blinds!) 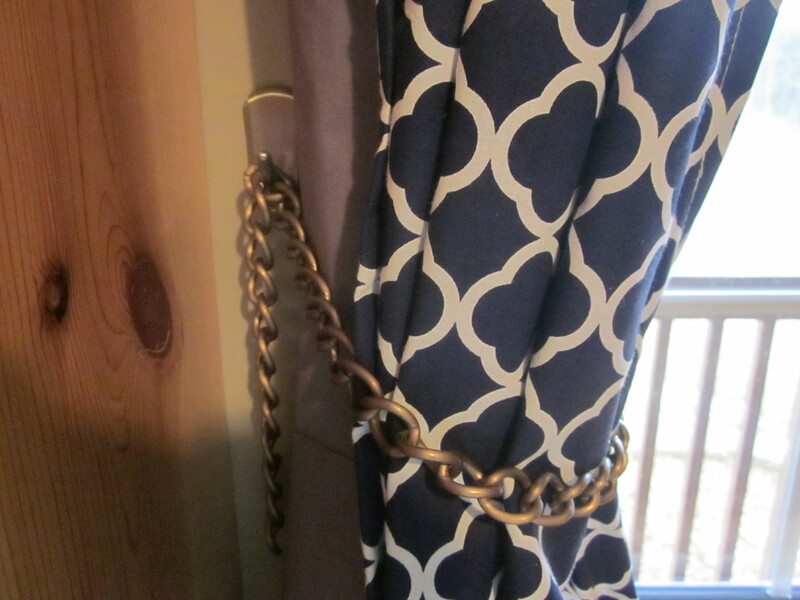 and we hung up a curtain rod. Since the built-in bookshelf is really close to the window, we couldn’t use traditional tiebacks. I had found an idea on Pinterest to use rope, but then I was at Michael’s and found these chains in the jewelry section. Cheap and ready-made! A couple 3M hooks later (the best we could find without putting a bunch of holes in the wall) and they were done! And just for fun, here are some pictures from behind the scenes… Emma has been all about ‘test driving’ baby’s stuff while we wait for him/her to arrive, and she now points at my belly and says “Baby.” Any day now!